2. Put 50g of hazelnuts in a food processor and blitz them until they are chopped up into fine pieces. 4. Use a large *metal* spoon (wood is too think and will deflate meringue) to *fold* (VERY gently incorporate) the chopped hazelnuts into the meringue. DO NOT MIX too much as this will ruin the meringue. 5. Using a fine mesh screen, dust cocoa powder into the meringue blend (now with added hazelnuts) and fold using only 3 or 4 turns of the spoon to create the marbled effect. Otherwise they won’t be marbled but do expect some clumped areas. 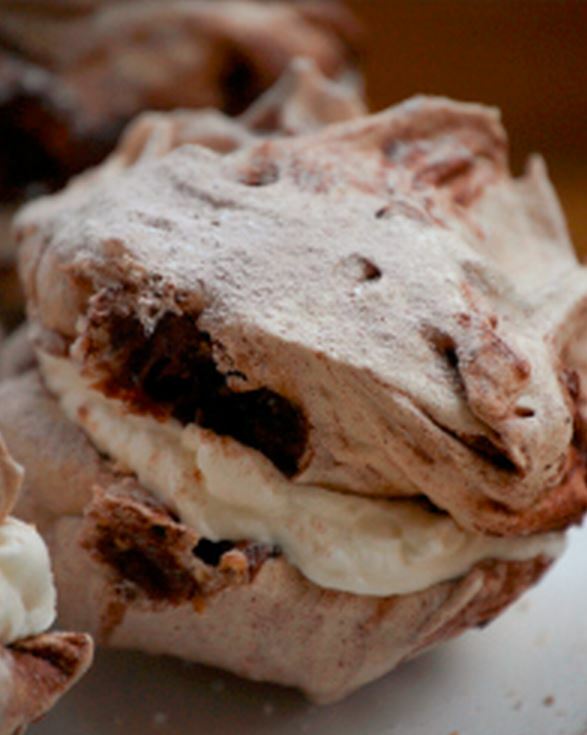 These may break through or cause different textures in your meringue. This is normal. 6. Now use a table spoon to create small balls of meringue and carefully place them on the baking tray. Once placed, gently and lightly flatten slightly with the back of the spoon you just used. 7. 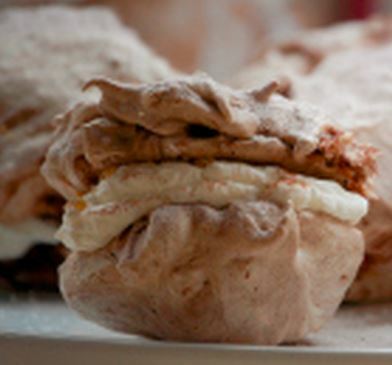 Place the meringues into the pre-heated oven for 1 hour (this is at a very low heat). 8. Turn off the oven and let meringues sit in oven until the oven has cooled. Consider leaving them to cool in the oven overnight which will be perfect – just make sure the oven is off first! 9. Whip the double cream with 50g sugar with a hand mixer until it forms soft peaks. Do not over-whip. 10. Carefully and gently spread the sweet cream onto the flat slide of one meringue and sprinkle with a few chopped hazelnuts. Use second un-creamed halfh as top of sandwich.